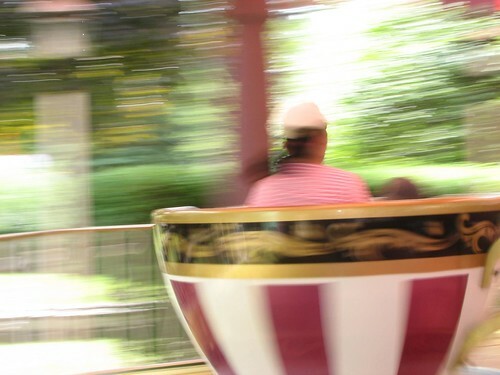 It will be a long time before I get on this tea cup ride again! Shortly after I returned from a trip to California last week, I had a very frightening dizzy spell upon waking up. But first my limited history with brain afflictions. First there was my close friend's car accident where she suffered a traumatic brain injury which has taken years (and counting) to recover from. Then there was my dad's strokes, brain cancer and descent into angry paranoia. There was Natasha Richardson. And a friend's experiences with transient ischemic attack (TMI) after his heart surgery. And finally Anissa's stroke and recovery. The most important thing that I take from these experiences is that your brain is your most vital organ that must be protected at all costs. So imagine lying awake in bed one morning and then suddenly the room shifting 180° violently from one side to the other, resetting, and then shifting again, all in rapid succession. I closed my eyes and it seemed to stop. I opened my eyes again and there it was, my room spinning around me, and I had no control over it. I was seeing it in my eyes! I held onto my bed, closed my eyes and wished for it to stop. I would try opening one eye or the other, and either way, the room violently swam around me. I closed my eyes for about fifteen minutes, while hyperventilating and sweating, and it finally stopped. I tried to sit up, but it started all over again. This time I lied on the other side, desperately clinging to my bed, wishing for it to stop. I thought I didn't feel the dizzyness when my eyes were closed, but my stomach felt otherwise. Every time I opened my eyes, they hurt from the spinning. I couldn't tell whether my eyes were flying around out of my control or what was causing the sense that my bedroom would not stay still. This was not your average off balance sense after having a few too many to drink or the bed tilting when you have a fever. The room was seriously flying around from one side to the other. If I were standing, I would instantly fall to the floor. If I were driving, I would have to stomp on the brakes to avoid hitting something. Finally after about an hour, it stopped enough so I was able to get up. It was really scary being so out of control, thinking something could be wrong with my brain. I visited the doctor in the afternoon and learned that I had labyrinthitis, a viral inner ear infection. She did a bunch of neurological tests to rule out any other cause and also mentioned that it had been going around. I was immediately put at ease, mostly because I trust her judgement, being a fellow Course 2 (mechanical engineering) MIT grad before changing her career to medicine. Yes, I pick my doctors on their engineering degrees . She recommended that I take some meclizine (Bonine) to ease the symptoms, or else just wait out the few days to few weeks it would take to subside. In the meantime, I was not to drive as two quick head turns could set off the dizzyness. Today is day two of dizzy Angela. Yes, I woke up with vertigo again and screamed for someone to bring me some medicine. This time, I took a more analytical approach when the dizzy spells occurred. I figured out that my eyes did indeed move around wildly when the room started spinning, and that the dizzyness continued when my eyes were closed. Unfortunately, the medicine's side effect of drowsiness knocked me out for about five hours of naps today. Tomorrow will be a no medicine day because all this sleeping is so not Angela. Hopefully the dizzyness will subside a bit. The velocity of the room spin has definitely decreased today, so the dizzy spells are more amusing than frightening. And thankfully, there is nothing wrong with my brain. I used to go through episodes of vertigo. The best I could do was lie in a completely dark room, in the fetal position, until the spinning stopped. Fortunately these episodes lasted no more than 24 hours. I think they were related to my hypothyroidism. Since getting my meds leveled out, I haven't had any vertigo. I can empathize. Dizzy spells like these can be very scary and completely disorienting. Yikes. I'm dizzy just thinking about it. Glad it was just an inner ear infection. I'm also personally glad that you choose people based on their ME degrees from MIT. That is totally working for me personally. Wow...sorry to hear about your dizzy spells. Something like this happened to me a few times back in grammar school and it scared the heck out of me. Later than night it would happen when I was in bed.....I don't think I ever told anyone about it (back then) so I never went to the doctor. I hope you feel much better today (1/17). You need to rest a lot, Fatigue weakens the immune system. Hope you feel better. Be very careful. Once you started have vertigo, they may come back once or twice in a year. You can avoid it by not over stress your body and your mind. Eek! Hoping you feel better, soon! Sorry that you have to deal with this. What an awful feeling. Hope you recover quickly. Thanks for all your well wishes. I'm perfectly fine today, with no other symptoms. Never had an ear infection along with it.